I know what you’re thinking, “overload!” “Too much!” But hang on, really think about each ingredient. Each of their texture. Their individual taste and their own juice factors. Now think about all of them together. Do you see it now? Taste it in your imagination maybe? 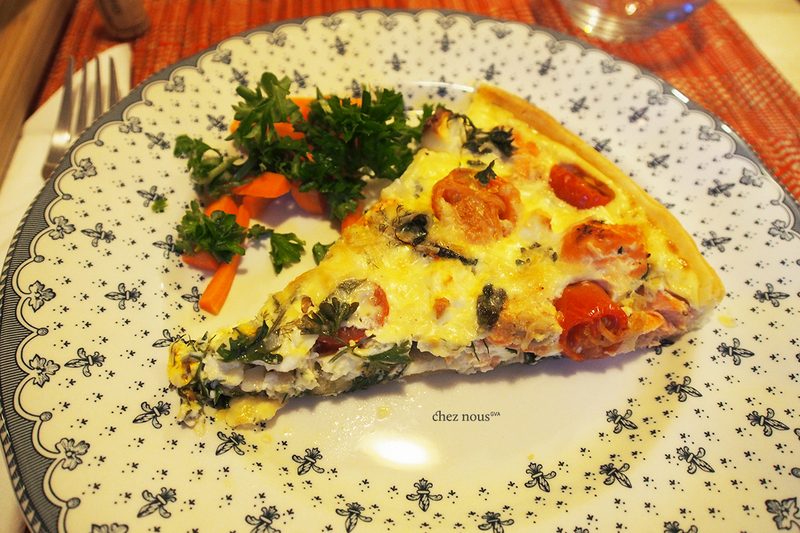 Honestly though, this quiche is so tasty! 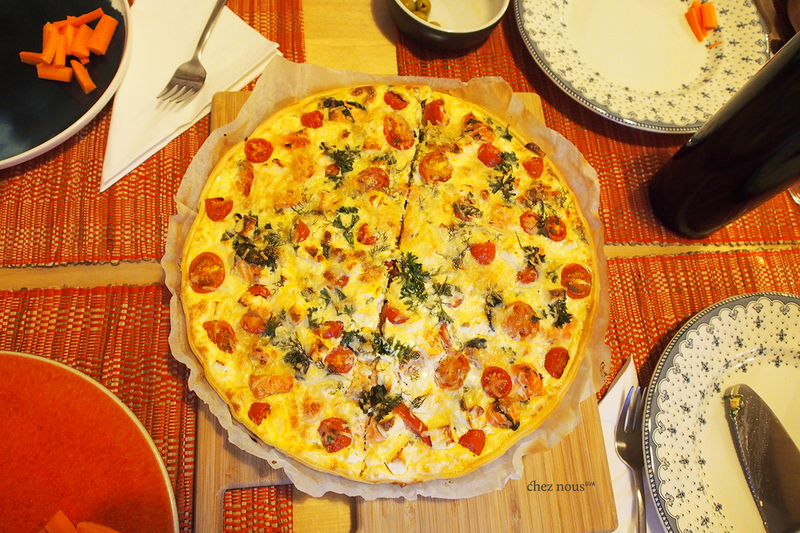 It is a lovely light summer dish perfect for those casual dinner parties or those gourmet outdoor picnics in the park. 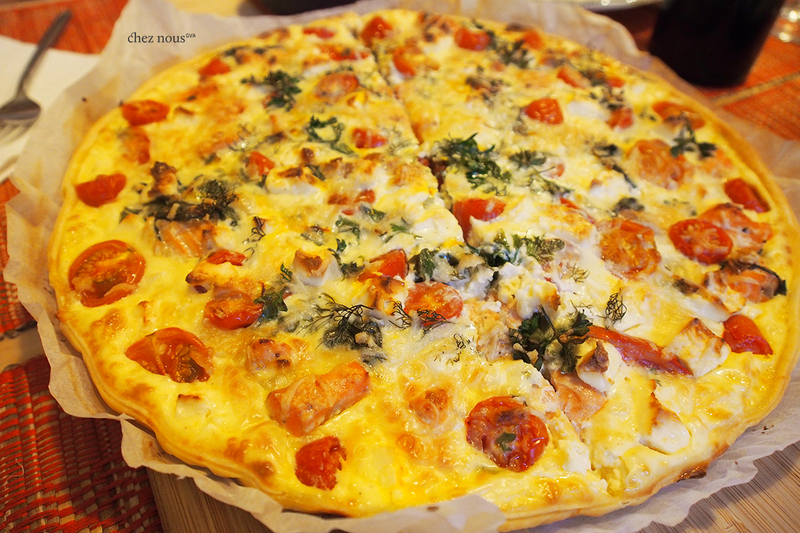 It covers all the bases of a proper meal with the salmon chunks and eggs for protein, tomatoes, spinach, leeks and herbs for vitamins and minerals, cheese and milk for calcium, and the pâte feuilleté for carbs. Enjoy it with a nice bottle of Chasselas blanc or a tangy bottle of Rosé. Mmm..
Pre-heat the oven at 200°C. Place the pâte feuilletée in a round baking dish. In a wok, sauté the shallots and garlic until shallots are soft and translucent. Add the leeks and then the salmon cubes. Season with salt and pepper, and let it cook for 1-2 minutes. Finally, add the spinach, and quickly remove from heat. Set aside and let it cool. In a bowl, beat the eggs. Add the cream, milk, salt, nutmeg and saffron. Mix all ingredients together until well-incorporated. Place the sautéed salmon and veggies on the dough. Make sure to distribute them equally throughout the pan. 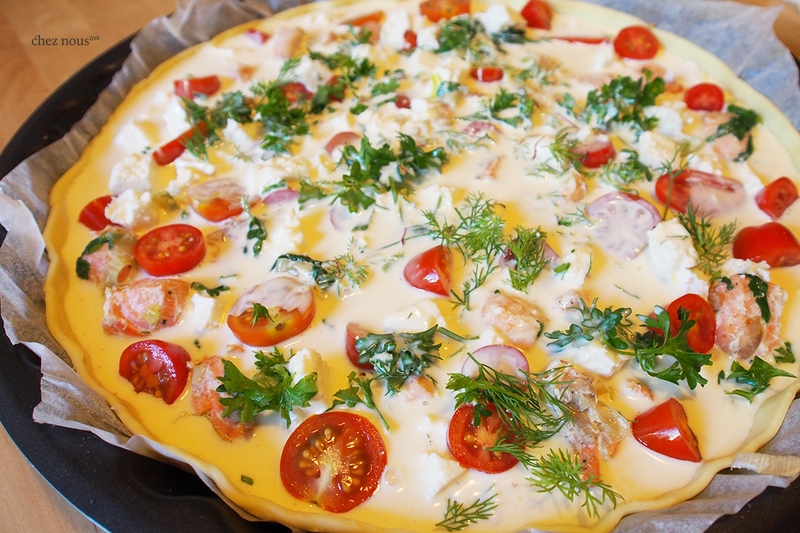 Add the cherry tomatoes, and then the feta cheese. Sprinkle some parsley and dill over the dish. Now, pour the egg/cream mixture gently. Top with a bit of grated goat’s cheese. Place the dish in the hot oven, and let it cook for 45 minutes.